Meet the women, hear their stories. Many of the rag rugs in our collection are anonymous. We can admire the craft, but know nothing about the actual crafter. But sometimes we’re lucky and can trace the origin of the rugs. Ingegerd was born in 1930 and grew up on a farm in our neighbourhood. She might look like a frail lady, but looks can be deceiving. She’s been a very independent, strong woman all her life, building a career where she’s gone from consumer advicer, to teaching and eventually to headmistress for a school, where agriculture, cooking and caring for farm animals sere taught. 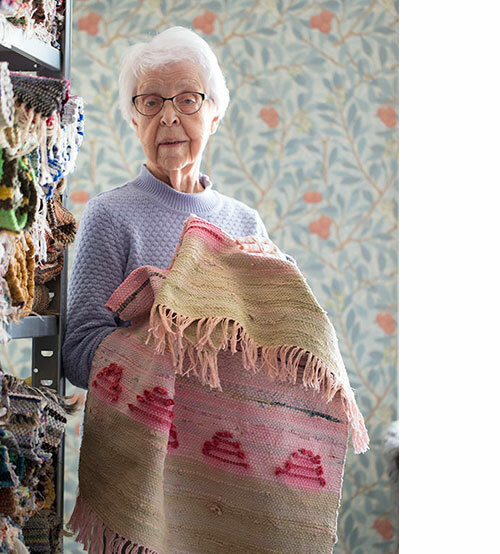 She still lives on the farm that’s been in her family for generations and tells of a time, when weaving rag rugs was a natural part of the household chores for a farmers wife. Rag rugs were valuable things, treated with care. 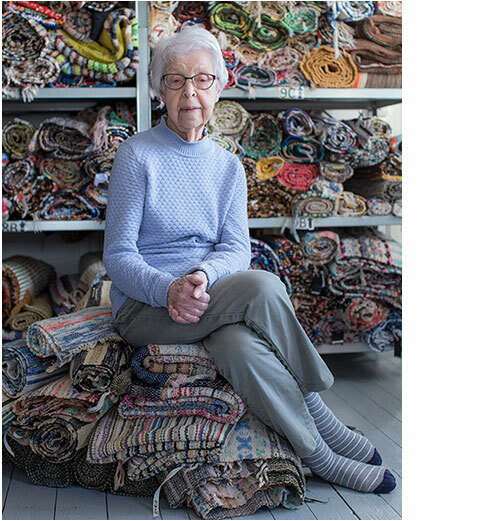 So it´s really not surprising, that Ingegerd still had a lot of rag rugs in her storage, made by her mother and even her grandmother. 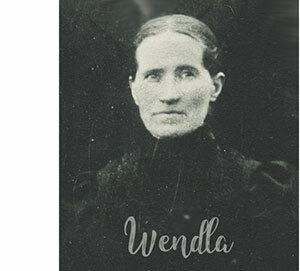 Her grandmother Wendla was born in 1860. She was never idle. In the summers she had plenty to do outdoors on the farm, but in the winter she would work by the loom. As a weaveress, she was pretty much self taught – having picked up tricks from older relatives. It wasn’t untill later, that actual weaving classes became a trend. 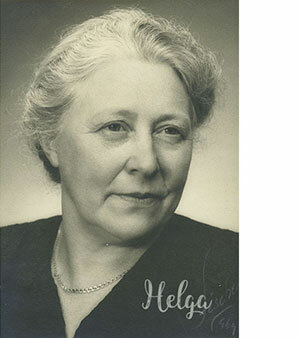 Ingegerd’s mother Helga was born 1896. In beginning of the 1900’s, getting an education of some sort had become more common. She attended school to learn all useful skills needed for keeping a household at a farm. And she also took actual, organized classes in weaving. It had been recognized, that weaving could be a useful trade. Not only to supply your own home with woven textiles, but a trade where women could earn some money – for herself or for the household. By organizing classes, the knowledge on weaving became widely spread and not just for a selected few. This picture from 1917, shows how cramped it was with looms, set up in the otherwise roomy home of the local priest where weaving classes were held. Helga looks serious and gathered. Not because of the weaving – which she enjoyed – but most likely because picturetaking was a serious thing and you had to sit very still, not to become blurry. 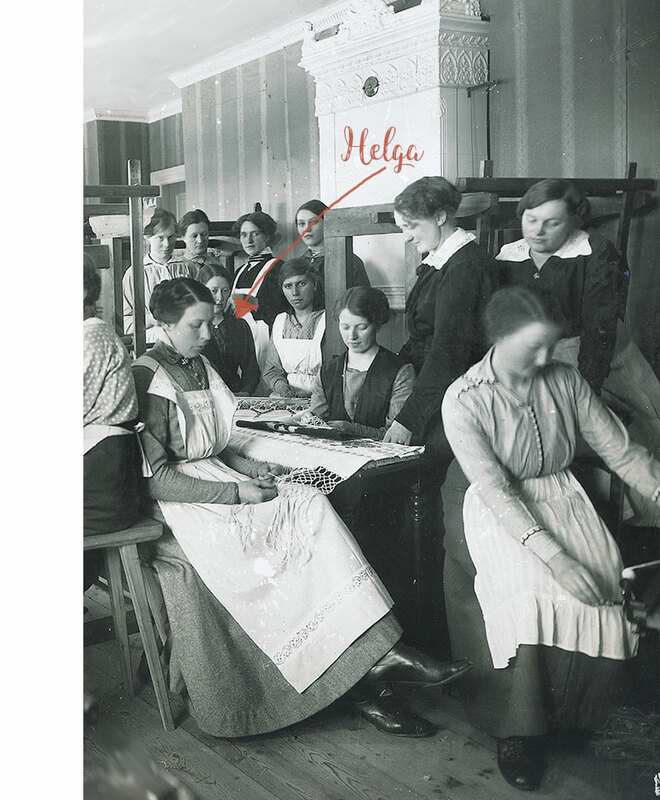 Helga had quite a distance to travel from home and since traveling was done by horsecarriage, she and a friend rented a small cottage at a farm close by while classes were held. Lucky for Ingegerd, since it was on that farm that Helga met with Erik, the son of the house – Ingegerd’s father to be. Eventually they married and Helga moved to that very same farm. Ingegerd remembers how her mother kept her looms (there were more than one, used for different kinds of weaves) in the annex on the farm. She made all the rugs ever needed in the house and they were seriously long rugs, meant to cover all parts of the floors were you’d walk. A way of protecting the floors. Cleaning the wooden floors were hard work and not something you’d like to do too often. Rugs also kept the drafty floors warmer. But they only had rugs in the nice rooms. In the kitchen, they invested in a hardwearing linoleum carpet. No fancy rugs needed then in a room where much work was going on, that could soil them. Ingegerd remembers “the cutting parties” from her childhood. Women from the village were invited for an afternoon, when everybody would join in to cut strips of rags for for the hostess’ rugweaving. There would be coffee and treats, gossip and laughter. The children helped by rolling up the strips in balls, sorted in colours. What about Ingegerd herself? Did she weave rugs, we ask. She did – but only two, as far as she remembers. Frankly, because it took to much time and effort, she thought. It might seem, that it would be quickly done with that chunky filling, but the one forgets all the cutting of fabric strips that it requires. Ingegerd found finer weaves more rewarding. 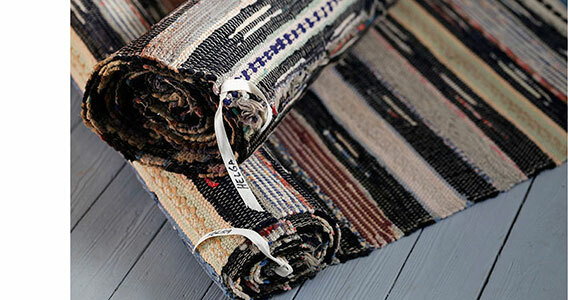 She chose to weave fine curtain fabrics and fabric for upholstering instead. Here she is, holding one of the two rag rugs she ever made. This one back in 1948. She was going to leave it with us, but we asked if she wouldn’t hold on to it as a memory after all. The rest of the lot, all the rugs from Wendla and Helga, came into our care. By and by, after having been cleaned and checked, photographed and measured, they will eventually make it out in our webshop. And for this collection, we are happy to be able to mark them with the name of the weaveress.